Recently a set of photos taken at the Kansas City’s Wonderland Arcade in the late 1960’s made rounds on the Internet. These photos are stored at the National Archives in the file “Wonderland Inc. v. United States of America, 1968 – 1968”. The National Archives allows searches but not direct links or bookmarks, so you will have to enter your own search terms. The Arcade located at 1200 Grand from the 1940’s to the early 1980’s was covered in the press numerous times, like this Billboard Magazine article: Wonderland Arcade Good Model of Well-run Amusement Center published in 1946, when The Billboard was still an amusement industry trade magazine. 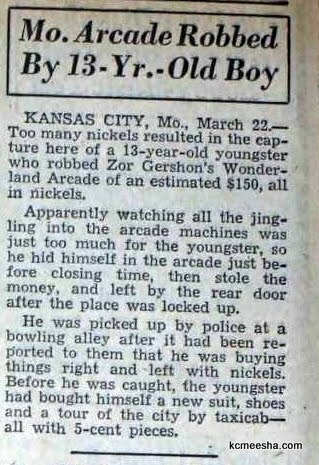 Same magazine in 1947 informed about the time when the Wonderland Arcade was robbed of $150 in nickels, some of which was spent on a “new suit, shoes and a tour of the city by taxicab”. 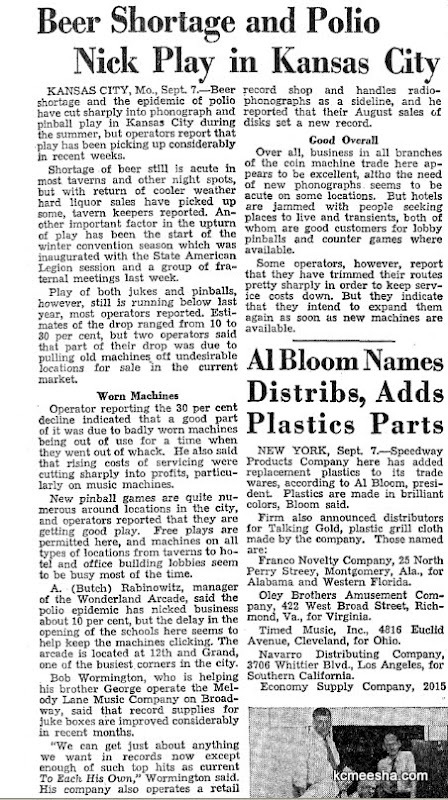 And you would be hard-pressed today to correlate a polio epidemic, beer shortage and the arcade business like this article in the 1946 Billboard. © Time Inc. Walter Sanders. Dec. 1943. Three wise owls can tell.... © Time Inc. Walter Sanders. Dec. 1943. Wonderland is lit up at night like a circus tent. © Time Inc. Walter Sanders. Dec. 1943. Love-rating machine operates similarly to Kiss-O-Meter. For a penny the curious measure their potency in this field. Bells announce result. Five rings is top rating. © Time Inc. Walter Sanders. Dec. 1943. Pinball machines are popular. Wonderland has 25, called variously Sky Chief, Border Town, Sport Parade and School Days, with appropriate mechanical obstacles. © Time Inc. Walter Sanders. Dec. 1943. Career Pilot operated by soldier to set his vocational sights. © Time Inc. Walter Sanders. Dec. 1943. Shake hands with your Uncle Sam. © Time Inc. Walter Sanders. Dec. 1943. Picture machines dispense framed photographs almost instantaneously for a dime. Because of their size they are fancied by servicemen for toting in their pockets. © Time Inc. Walter Sanders. Dec. 1943. Kiss-O-Meter measures “thrill of your kisses” as “exciting”, “sour”, “naughty”. © Time Inc. Walter Sanders. Dec. 1943. Very naughty strip poker. © Time Inc. Walter Sanders. Dec. 1943. Shooting gallery is 50 ft long. Its best patrons are servicemen. They also like gun machines whose targets are miniature planes moving slowly across a simulated sky. © Time Inc. Walter Sanders. Dec. 1943.